150 Swiss mercenaries arrived in Rome on January 22, 1506, considered the official date of the Swiss Guard’s foundation. The soldiers’ uniforms consisted of a doublet or jacket worn over metal armor, with a sleeveless black cape to protect against rain and cold. The jacket was most likely emblazoned with either the Swiss cross or the crossed Papal keys. 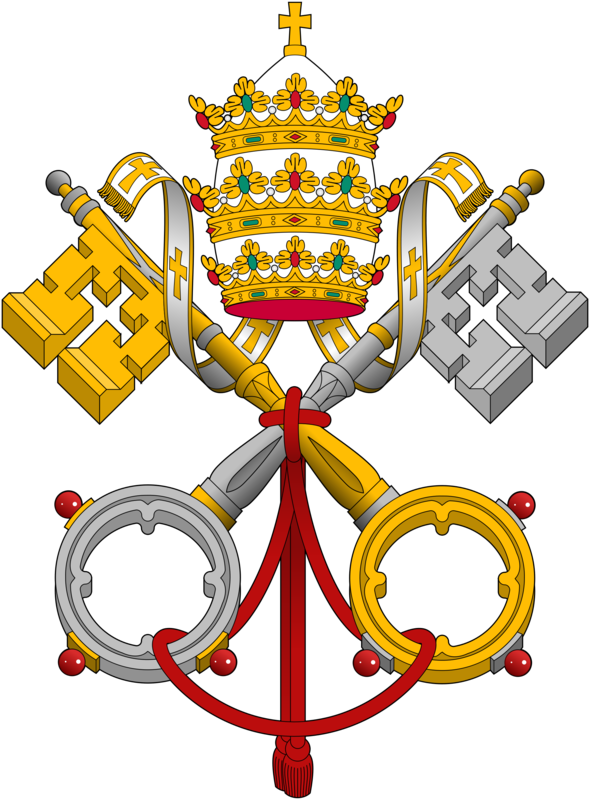 The coat of arms of the Holy See, with the crossed keys symbolizing the keys of Heaven entrusted to Saint Peter. Pope Julius outfitted his new guard in yellow and blue, the Rovere family colors. His successor, Pope Leo X (1513–1521), added red to the uniforms to make red, yellow and blue, the colors of his own family, the Medici of Florence. 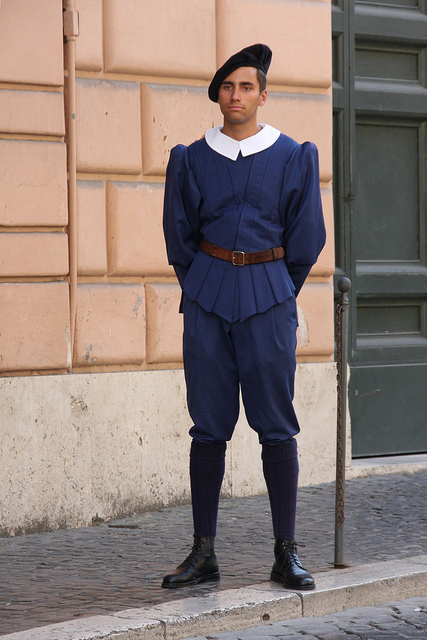 Originally the Swiss Guard wore various types of head gear. Wide brimmed hats, as well as padded leather caps and metal helmets, have been depicted in period art. All these were trimmed with brightly colored pheasant or heron feathers. The metal helmet, however, was soon replaced with the morion — a high-crested open helmet with upward-turning front and back edges. 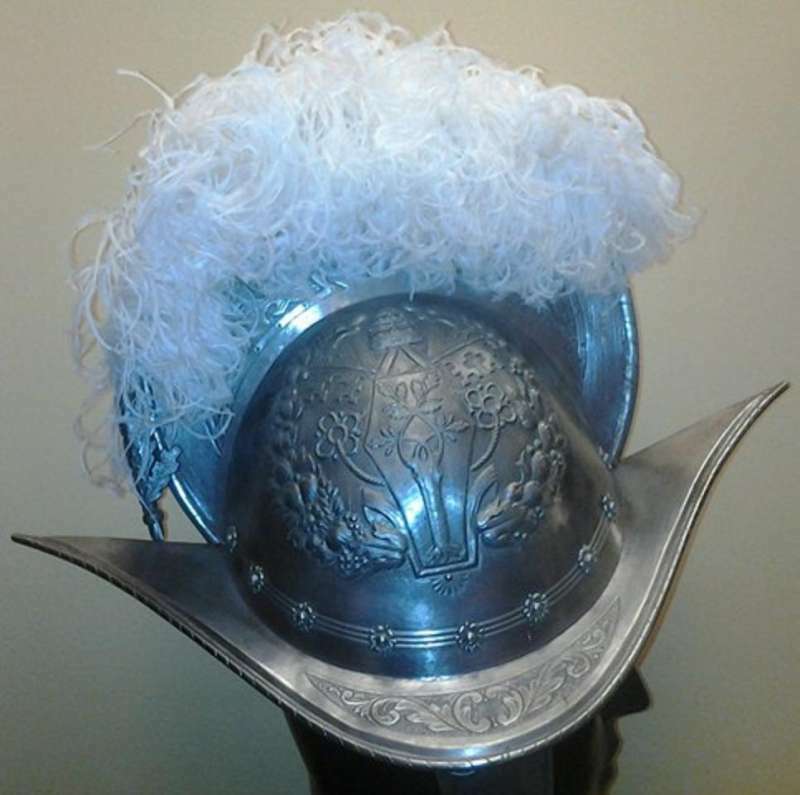 Morion of the Swiss Guard, topped with the white plume of a commandant or sargeant major. 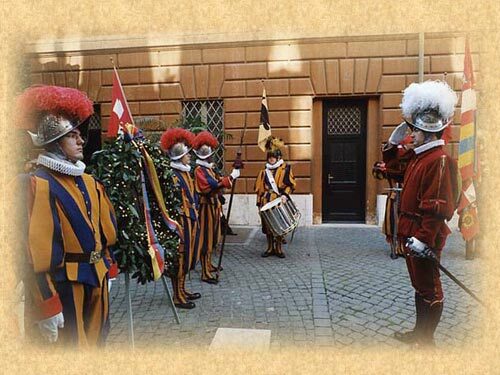 Today, most of the Swiss Guard’s function is ceremonial. Their everyday uniform – including the cape (when worn) — is completely blue. Their headgear is a plain, black beret. On special occasions, the Guard wears a ceremonial dress uniform that includes a forged breast plate, a ruff, and white gloves. It consists of 154 pieces and takes nearly 32 hours and 3 fittings to complete. It includes a morion topped with an ostrich-feather plume: white for the commandant and sergeant major, purple for lieutenants, red for halberdiers (privates) and yellow/black (on a black morion) for the drummers. The current uniforms were first commissioned in 1914. They could not have been designed by Michelangelo. However, they were inspired by frescos of Landesknechte (German mercenary knights) as painted by Michelangelo’s contemporary, Raphael. 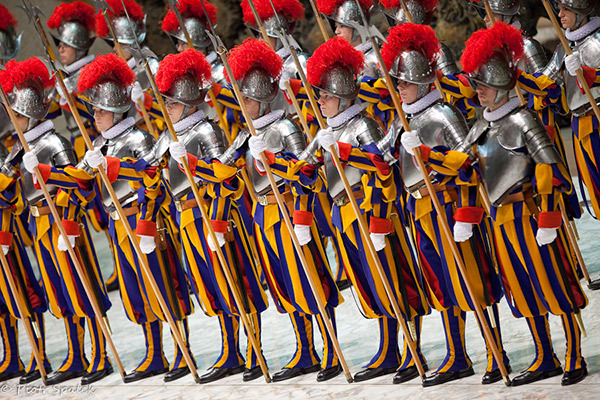 But while these colorful outfits may be ceremonial, the Swiss Guard means serious business. Its mission to protect the Pope at all costs was proved during the 1527 sack of Rome by the Holy Roman Emperor Charles V. On that date, 147 men of the Swiss Guard (more than 80% of their number) died to allow Pope Clement VII to escape the Vatican unharmed. In keeping with its mission, the soldiers of the Swiss Guard are trained in not only the Guard’s traditional weapons — the halberd (or pike) and sword — but in unarmed combat, crowd control, and the use of small arms. Following the May 13, 1981 assassination attempt on Pope John Paul II, their guns have included the Sig Sauer P220 pistol, and whatever rifle is standard-issue with the Swiss Army. 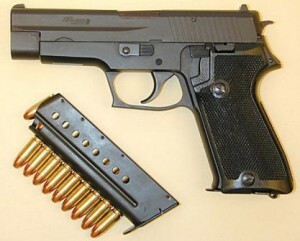 The Sig Sauer P220 pistol. To qualify as a Swiss Guard, an applicant must be an unmarried Swiss citizen of the Catholic faith, who is under the age of 30 and at least 5’ 8 ½” tall. The applicant must have satisfactorily completed service with the Swiss Army. For now, at least, applicants must also be men. During their swearing-in ceremony on May 6th – the anniversary of the sack of Rome – new Swiss Guards must take an oath of loyalty. Much like the U.S. Secret Service is sworn to protect the President, Swiss Guards swear to protect the Pope at all costs… even with their lives. This entry was posted in Fashion, History, Italy, Papacy, Religion and tagged della Rovere, Emperor Charles V, Landsknecht, Medici, Michelangelo, morion, Pope Clement VII, Pope John Paul II, Pope Julius II, Pope Leo X, Raphael, sack of Rome, Swiss Guard, Vatican Guard by Jackie Fuchs. Bookmark the permalink. Reblogged this on Nothing Too Trivial.